Still, in the design phase, the concept elements for the rooftop will include a modern private pool club and lounge with a retractable roof. An upscale 12,000-square-foot two-story restaurant and outdoor bar with covered patio will complete the space with an open area for relaxing and enjoying the view. Visitors will enjoy an infinity-edge pool that drops off into the city skyline. “The goal is to transform this one-acre area in the sky that overlooks the Atlanta skyline at The Interlock into the ultimate rooftop experience,” said Jeff Garrison, partner with S.J. Collins Enterprises. “We envision this will be the perfect place to grab a drink during happy hour after work or host any events or celebrations,” said Garrison. 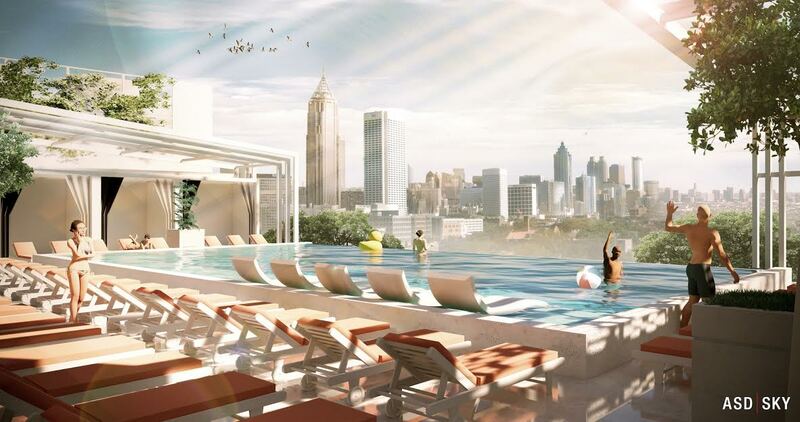 The development team describes the future space as a rooftop oasis for unwinding and enjoying friends with some of the best views of the Atlanta skyline. 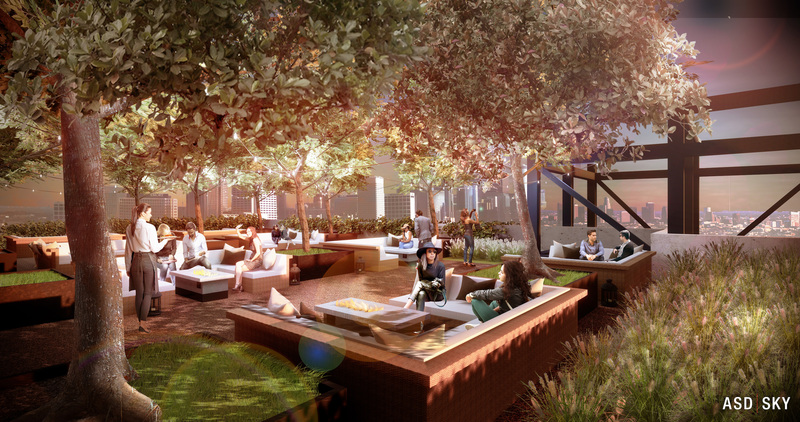 JLL Atlanta brokered the deal, and ASD SKY provided the initial renderings and design for space. Where culture, technology, and commerce converge, The Interlock will offer unprecedented space in the Atlanta marketplace that goes beyond a curated selection of stylish storefronts and eateries. The Interlock will offer a versatile mix with 200,000 square feet of loft office space, 105,000 square feet for retail, 350 apartment units, 70 single-family homes, and a 145-key Marriott Tribute Portfolio hotel. Of the 200,000 square feet of loft office space, Georgia Technology Ventures will operate a 50,000-square-foot incubator space with a mission of promoting and growing tech start-ups in the southeast. Located at the intersection of 14th Street and Howell Mill Road, The Interlock was designed to encourage walking, biking and enjoying energized open space within an urban environment. With plenty of green space, patios and a wide multi-use path that connects each end of the property, visitors can gather, stroll and enjoy the open-air landscape. Kelvin and Mandy Slater have called Atlanta home since 2000. Originally from Florida and with over 50 collective years in the restaurant and hospitality business, the couple founded Slater Hospitality in 2015 and set out to take on the project of The Roof at Ponce City Market, which houses original concepts Nine Mile Station, an elevated beer garden; Skyline Park, featuring boardwalk-style games and amusements inspired by Coney Island; Rooftop Terrace, a tented private event space; and public lounge and private event space, and private, members-only cocktail and social club, RFD Social. 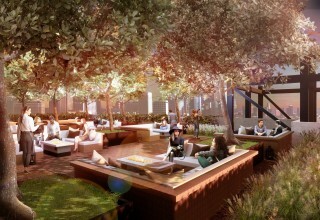 For more information, visit www.poncecityroof.com. Founded in 2007, S.J. Collins Enterprises is a privately held, commercial real estate and retail development firm. The company has acquired and developed more than 60 retail, mixed-use, multifamily and office projects throughout the continental U.S. The company is headquartered in Ga. For more information, visit SJCollinsEnt.com or www.TheInterlockATL.com.